The Raving Queen: "But Patty's Only Seen The Sights A Girl Can See From Brooklyn Heights!!!!!!!!!" "But Patty's Only Seen The Sights A Girl Can See From Brooklyn Heights!!!!!!!!!" From Zanzibar, to Barkley Square! of Brooklyn Heights, (where the Lanes, Patty's family, lived) would be in for, and I began to wonder. Did the Lanes' Brooklyn Heights of the day bear any relation to the real one? Or was it Hollywood's version? 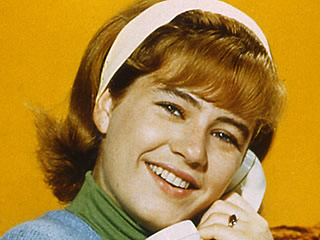 What was the real one like, in the time of "The Patty Duke Show." This show did some number on me as a child, darlings!!!!!!!!! It created such elevated expectation for me about adolescence--popularity, malt shops, everything!!!!!!!!!!! No wonder I was so frustrated when things did not turn out that way! While I certainly cannot blame this TV show entirely for that, I wonder, had my expectations been less high, I might have had a better time of it!!!!!!!!! But, let's face it, some of us who don't "have it" then, get it later!!!!!!!!! And, if you've been reading this blog, girls, you know I have moved well beyond malt shops!!!!!!!!!!!!!!!!! I should have paid more attention to Kitty Sullivan, as Patty's nemesis, Sue Ellen ("MY father is President of a bank!!!!!!!!!) It would have given me a glimpse of what I was actually in for!!!!!!!! I ended up going to high school with a constellation of Sue Ellens, which ended my expectations, darlings!!!!!!!!!!!!!!!!!!!!!!!!!!!!!!! Whenever I wander through Brooklyn Heights, "The Patty Duke Show" occasionally passes through my mind. More often than not, these days, this is supplanted by thoughts of "Valley Of The Dolls," "Moonstruck," and "The Sentinel"
But. Patty, darling, do you still like to rock and roll? Does a hot dog make you lose control?????????????????? Good For The Gorilla, Girls!!!!!!!!!!!!!!!!!!!!!! Are You Ready For The Summer???????????????????? Is This Bay Ridge? Or Beirut??????????????????? "It Was Forty-Six Years Ago Today.........."